Activision Blizzard, Inc. is an American video game and film holding company based in Santa Monica, California. The company was founded in July 2008 through the merger of Activision and Vivendi Games, the company is traded on the NASDAQ stock exchange under the ticker symbol ATVI, and since 2015 has been one of the stocks that make up the S&P 500. Activision Blizzard currently includes five business units: Activision Publishing, Blizzard Entertainment, King, and Major League Gaming, and Activision Blizzard Studios. The company owns and operates additional studios under an independent studios model under Activision Publishing, including Treyarch, Infinity Ward, High Moon Studios and Toys for Bob. Among major intellectual properties produced by Activision-Blizzard includes Call of Duty, Guitar Hero, Tony Hawk's, and Spyro/Skylanders through Activision's studios, World of Warcraft, StarCraft, Diablo, Hearthstone, and Overwatch through Blizzard Entertainment, and mobile titles including Candy Crush Saga through King. Activision-Blizzard's titles have broken a number of release records. As of March 2018[update], it is the largest game company in the Americas and Europe in terms of revenue and market capitalization. In 1991, Bobby Kotick and a group of investors had acquired the failing Mediagenic, the company that Activision had become from former leadership. Kotick instituted a large restructuring to pull the company out of debt, including renaming the company as Activision and moving it to Santa Monica, California. After bringing the company back to profitability by 1997, Kotick spent the next decade expanding Activision's products through acquisitions of an estimated 25 studios, which resulted in several successful series of games, including Tony Hawk's, Call of Duty, and Guitar Hero. However, by around 2006, the popularity of massively multiplayer online (MMO) games started to grow. Such games provide a constant revenue stream to their publishers, rather than only a single purchase, making them a more valuable proposition. None of Activision's subsidiaries had an MMO or the capability to make one quickly. Furthering this, Activision was facing tougher competition from companies like Electronic Arts, as well as slowdowns in sales of their key game series. Around 2006, Kotick reached out to Jean-Bernard Lévy, the CEO of the French media conglomerate Vivendi. Vivendi at that time had a small games division, Vivendi Games, a holding company principally for Sierra Entertainment and Blizzard Entertainment. Kotick wanted to get access to Blizzard's World of Warcraft, a successful MMO, and suggested a means to acquire this to Lévy. Lévy instead offered that he would be willing to merge Vivendi Games with Activision, but only if Vivendi kept majority control of the merged company. According to those close to Kotick, Kotick was concerned about this offer as it would force him to cede control of Activision. However, after talking to Blizzard's CEO Mike Morhaime, Kotick recognized that Vivendi would be able to give them inroads into the growing video game market in China. Kotick proposed the merger to Activision's board, which agreed to it in December 2007. The new company was to be named Activision Blizzard, and would retain its central headquarters in California. Bobby Kotick of Activision was announced as the new president and CEO, while René Penisson of Vivendi was appointed chairman. The European Commission permitted the merger to take place in April 2008, approving that there weren't any antitrust issues in the merger deal. 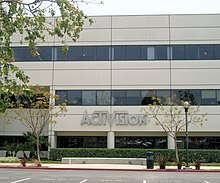 On July 8, 2008, Activision announced that stockholders had agreed to merge, and the deal closed the next day for an estimated transaction amount of US$18.9 billion. Vivendi was the majority shareholder, with a 52% stake in the company. The rest of the shares were held by institutional and private investors, and were to be left open for trading on the NASDAQ stock market for a time under NASDAQ: ATVID, and subsequently as NASDAQ: ATVI (Activision's stock ticker). At this point, Lévy replaced René Penisson as chairman of Activision Blizzard. The merger made Activision Blizzard the parent company of Vivendi Games' former divisions. While Blizzard retained its autonomy and corporate leadership in the merger, other Vivendi Games divisions such as Sierra ceased operation. With the merger, Kotick was quoted stating if a Sierra product did not meet Activision's requirements, they "won't likely be retained." Some of these games ultimately were published by other studios, including Ghostbusters: The Video Game, Brutal Legend, The Chronicles of Riddick: Assault on Dark Athena, and 50 Cent: Blood on the Sand. However, a number of Sierra's games such as Crash Bandicoot, Spyro the Dragon and Prototype were retained and are now published by Activision. Activision Blizzard does not publish games under its central name and instead uses the Activision Publishing subsidiary and its studios to publish games. In early 2010, the independent studio Bungie entered into a 10-year publishing agreement with Activision Blizzard. By the end of 2010, Activision Blizzard was the largest video games publisher in the world. The 2011 release of Activision Blizzard's Call of Duty: Modern Warfare 3 grossed $400 million in the US and UK alone in its first 24 hours, making it the biggest entertainment launch of all time. It was also the third consecutive year the Call of Duty series broke the biggest launch record; 2010's Call of Duty: Black Ops grossed $360 million on day one; and 2009's Call of Duty: Modern Warfare 2 brought in $310 million. Call of Duty: Black Ops III grossed $550 million in worldwide sales during its opening weekend in 2015, making it the biggest entertainment launch of the year. In 2011, Activision Blizzard debuted its Skylanders franchise, which led to the press crediting the company with inventing and popularizing a new toys-to-life category. The first release Skylanders: Spyro's Adventure was nominated for two Toy Industry Association awards in 2011: "Game of the Year" and "Innovative Toy of the Year". Skylanders: Spyro's Adventure and its sequels were released for major consoles and PC, and many were released on mobile devices as well. Activision Blizzard at Gamescom 2013, where the company exhibited 2013 titles such as Call of Duty: Ghosts and Skylanders: Swap Force. On July 25, 2013, Activision Blizzard announced the purchase of 429 million shares from owner Vivendi for $5.83 billion, dropping the shareholder from a 63% stake to 11.8% by the end of the deal in September. At the conclusion of the deal, Vivendi was no longer Activision Blizzard's parent company, and Activision Blizzard became an independent company as a majority of the shares became owned by the public. Bobby Kotick and Brian Kelly retained a 24.4% stake in the company overall. In addition, Kotick remained the president and CEO, with Brian Kelly taking over as chairman. On October 12, 2013, shortly after approval from the Delaware Supreme Court, the company completed the buyback, along the lines of the original plan. Vivendi sold half its remaining stake on May 22, 2014, reducing its ownership to 5.8%. and completely exited two years later. Activision Blizzard released a new title, Destiny, on September 9, 2014. The game made over $500 million in retail sales on the first day of release, setting a record for the biggest first day launch of a new gaming franchise. On November 5, 2013, the company released Call of Duty: Ghosts, which was written by screenwriter Stephen Gaghan. On its first release day the game sold $1 billion into retail. In 2014, Activision Blizzard was the fifth largest gaming company by revenue worldwide, with total assets of US$14.746 billion and total equity estimated at US$7.513 billion. Activision Blizzard joined the S&P 500 on August 28, 2015, becoming one of only two companies on the list related to gaming, alongside Electronic Arts. The company released the next iteration of the Skylanders franchise in September 2015, which added vehicles to the "toys to life" category. On September 15, 2015, Activision and Bungie released Destiny: The Taken King, the follow up to the Destiny saga. Two days later, Sony announced that the game broke the record for the most downloaded day-one game in PlayStation history, in terms of both total players and peak online concurrency. Activision Blizzard acquired social gaming company King, creator of casual game Candy Crush Saga, for $5.9 billion in November 2015. In November 2015, Activision Blizzard announced the formation of Activision Blizzard Studios, a film production arm that would produce films and television series based on Activision Blizzard's franchises. The outfit is co-headed by producer Stacey Sher and former The Walt Disney Company executive Nick van Dyk. In June 2017, Activision Blizzard joined the Fortune 500 becoming the third gaming company in history to make the list after Atari and Electronic Arts. In its 2018 fiscal year earnings call to shareholders in February 2019, Kotick stated that while the company had seen a record year in revenue, they would be laying off around 775 people or around 8% of their workforce in non-management divisions, "de-prioritizing initiatives that are not meeting expectations and reducing certain non-development and administrative-related costs across the business", according to Kotick. Kotick stated that they plan to put more resources towards their development teams and focus on esports, Battle.net services, and the publisher's core games which include Candy Crush, Call of Duty, Overwatch, Warcraft, Diablo, and Hearthstone. Prior to this, Activision Blizzard and Bungie agreed to terminate their distribution deal with Destiny 2 as it was not bringing in expected revenue for Activision, with Bungie otherwise retaining all rights to Destiny. This transaction allowed Activision-Blizzard to report US$164 million as part of its 2018 fiscal year filings. Activision Publishing, which handles the development, production, and distribution of video games from its subsidiary studios. Blizzard Entertainment, which handles the development, production, and distribution of Blizzard's games. It also houses the company's esports activities including MLG and the Overwatch League. King, which handles the development and distribution of its mobile games. There are also two non-reporting segments within Activition Blizzard. Activision Blizzard Studios oversees the production of film and television entertainment based on the company's properties. Activision Blizzard Distribution provides logistical support for Activision Blizzard's distribution within Europe. Activision Blizzard owns the Call of Duty and StarCraft franchises, both of which have been popular as esports. On October 21, 2015, Activision Blizzard announced the upcoming establishment of a new e-sports division. Named Activision Blizzard Media Networks, the division is led by sports executive Steve Bornstein and Major League Gaming (MLG) co-founder Mike Sepso, with assets from the acquisition of the now defunct IGN Pro League. Bornstein was appointed the new division's chairman. On December 31, 2015, it was reported that "substantially all" of Major League Gaming's assets would be acquired by Activision Blizzard. The New York Times reported that the acquisition was intended to bolster Activision Blizzard's push into e-sports, as well as its plan to develop an e-sports cable channel. Reports indicated that MLG would be shuttered, and that the majority of the purchase price would go towards paying off the company's debt. Activision Blizzard acquired MLG on January 4, 2016 for $46 million. In November 2016, Blizzard Entertainment, a subsidiary of Activision Blizzard, announced the launch of Overwatch League, a professional video gaming league. The league's first season began during the second halfo of 2017 with 12 teams. The league's structure is based on traditional sports structures, including recruiting traditional sports executives as team owners, such as Robert Kraft, owner of the New England Patriots, and Jeff Wilpon, COO of the New York Mets. The inaugural Overwatch Grand Finals was played at the Barclays Center in Brooklyn in August 2018 and attracted 10.8 million viewers worldwide. The league hopes to have 18 teams competing during the second season in 2019, with an ultimate goal of 28 teams across the world. In 2018, Activision Blizzard signed a multi-year deal with Walt Disney to stream Overwatch League games on both ESPN and Disney XD cable channels. Since 2009, when CEO Kotick launched Call of Duty Endowment (CODE), over 50,000 veterans have been placed in high-quality jobs. In 2013 CODE started the "Seal of Distinction" program which recognizes non-profit organizations that are successful placing veterans in good jobs. Winners receive a $30,000 grant to use in their veteran job placement activities. The goal of CODE is to help 100,000 US and UK veterans find high-quality jobs by 2024. Activision Blizzard was recognized on the Fortune 100 Best Companies to Work For in 2015, 2016, 2017 and 2018. In 2017 the company was recognized as one of the Best Large Workplaces in Southern California. The company was on People magazine's 2018 Companies that Care list in 2017 and 2018. Worlds, Inc. was issued several United States patents around 2009 related to "System and method for enabling users to interact in a virtual space", which generally described a method of server/client communications for multiplayer video games, where players would communicate through avatars. In early 2009, Worlds, Inc. stated its intent to challenge publishers and developers of MMOs, naming Activision as one of its intended targets. Worlds, Inc. had already challenged NCSoft for its MMOs in 2008. The companies ultimately settled out of court by 2010. Worlds, Inc. launched its formal lawsuit against Activision Blizzard, including both Blizzard Entertainment and Activision Publishing, in March 2012, stating that Call of Duty and World of Warcraft infringed on their patents. Activision Publishing filed a separate patent infringement lawsuit in October 2013, asserting that Worlds, Inc. was using two Activision-owned patents in its Worlds Player software, but this suit was dismissed with prejudtice by June 2014. In Worlds, Inc. case against Activision, the judge issued a summary judgement in Activision's favor, as they had demonstrated that Worlds, Inc. had demonstrated the technologies of their patents in their client programs AlphaWorld and World Chat, released before the 1995 priority date, though this was related to filing irregularities that were subsequently corrected by the Patent Office. Activision did not challenge the updated patents through an inter partes review (IPR), and subsequently after a statutory one-year waiting period, Worlds, Inc. filed a subsequently lawsuit against Activision, asserting Call of Duty: Ghosts violated their resolved patents. Later, Worlds, Inc. stated the intent to add Bungie to the lawsuit contending that Destiny also fell afoul of their patents. Bungie subsequently filed three IPRs with the Patent Office for each of the three Worlds, Inc. patents at the core of the lawsuit. The new Worlds, Inc. case against Activision Blizzard was heard on October 3, 2014. With Bungie's IPRs pending at the Patent Office, the judge put the trial on hold pending the outcome of the IPRs. Worlds, Inc. challenged the IPRs at the Patent Office, as they did not include Activision as an interested party, a requirement that would have been necessary given the publisher/developer relationship between Activision and Bungie. The Patent Office did not accept this argument, and subsequently agreed with the Bungie IPRs that portions of Worlds, Inc. patents were invalid. Worlds, Inc. appealed to the Federal Circuit Appeals Court, challenging the validity of the IPRs due to the lack of Activision's involvement. The Federal Circuit court ruled in favor of Worlds, Inc. in September 2018, invalidating the Patent Office's decision. Worlds, Inc.'s case presently remains at the Patent Office stage, which is re-reviewing the IPRs in consideration of the Federal Circuit's ruling. In early 2010, Activision fired Vince Zampella and Jason West, two of the founders of its studio Infinity Ward, on the basis of "breaches of contract and insubordination"; the move caused several other Infinity Ward staff to resign. Zampella and West created a new studio, Respawn Entertainment, with help from Electronic Arts' partner program, hiring several of those that departed Infinity Ward in their wake. Zampella and West filed a lawsuit in April 2010 against Activision, claiming unpaid royalties on the studio's Call of Duty: Modern Warfare 2. Activision filed a countersuit against the two, accusing the pair of being "self-serving schemers". Activision later sought to add Electronic Arts to their suit, discovering that Zampella and West had been in discussions with them while still working for Activision, and further added claims against Zampella and West that the two had not returned all material related to Call of Duty while they were working at Respawn. A separate lawsuit was filed against Activision in April 2010 by several current and former members of Infinity Ward on the same basis of lack of unpaid royalties. All parties came to an undisclosed settlement to end all suits by May 2012. Electronic Arts and Activision had settled separately on Activision's charges of poaching employees, while the suits between Activision, Zampella, West, and the Infinity Ward employee group were settled by the end of May 2012. All settlements were made for undisclosed amounts. ^ Alexander, Leigh. "Activision Blizzard Merger Finalized". kotaku.com. Retrieved July 20, 2018. ^ a b c d e f "Activision Blizzard, Inc. Form 10-K". February 28, 2019. ^ Tarver, Evan (March 15, 2016). "Top 5 Mutual Fund Holders of Activision Blizzard (ATVI, FOCPX)". Investopedia. Archived from the original on March 20, 2016. Retrieved March 29, 2016. ^ a b Thorsen, Tor; Sinclair, Brendan (May 5, 2009). "Vivendi CEO Activision Blizzard's new chairman". GameSpot. Archived from the original on July 17, 2012. Retrieved August 27, 2009. ^ a b Takahashi, Dean (August 27, 2015). "Call of Duty publisher Activision Blizzard joins the S&P 500". VentureBeat. Archived from the original on September 5, 2015. Retrieved October 23, 2015. ^ a b "Activision - Blizzard: Our Company". activisionblizzard.com. Archived from the original on January 18, 2016. Retrieved January 11, 2016. ^ a b "Activision Blizzard to Buy King Digital, Maker of Candy Crush". The New York Times. November 2, 2015. Archived from the original on November 6, 2015. Retrieved November 3, 2015. ^ a b c d e f "Activision Blizzard beefs up e-sports muscle". CNET. Archived from the original on January 3, 2016. Retrieved January 4, 2016. ^ a b Morris, Chris (October 22, 2015). "Why Activision-Blizzard just launched a new eSports division". Fortune. Archived from the original on November 10, 2015. Retrieved November 13, 2015. ^ a b Goldfarb, Andrew (November 6, 2015). "Call of Duty Movie, Skylander TV Show Headline New Activision Blizzard Film Studio". IGN. Archived from the original on November 6, 2015. Retrieved November 6, 2015. ^ a b "MW3 Breaks Black Ops Launch Record". November 11, 2011. Archived from the original on November 12, 2011. Retrieved November 11, 2011. ^ a b Knight, Shawn (January 15, 2016). "'Call of Duty: Black Ops III' was the best-selling game of 2015". TechSpot. Archived from the original on January 18, 2016. Retrieved January 28, 2016. ^ Jordan, Jon. "Earnings report roundup: Game industry winners and losers in Q4 2017". www.gamasutra.com. ^ a b Beller, Peter (January 15, 2009). "Activision's Unlikely Hero". Forbes. Retrieved February 12, 2019. ^ "Vivendi and Activision to Create Activision Blizzard - World's Largest, Most Profitable Pure-Play Video Game Publisher". Activision.com. December 2, 2007. Archived from the original on February 7, 2012. Retrieved January 6, 2016. ^ Sliwinski, Alexander. "EU greenlights Activision-Vivendi merger". Archived from the original on April 20, 2008. ^ a b Thang, Jimmy. "Activision/Vivendi Games Merger Approved: Stockholders support Activision Blizzard venture". Archived from the original on August 1, 2008. ^ Alexander, Leigh (July 8, 2008). "Activision Blizzard Merger Official". Kotaku. Archived from the original on March 3, 2016. Retrieved January 15, 2016. ^ a b "Blizzard stay autonomous in Activision merger, Sierra not so lucky - Strategy Informer". Archived from the original on July 29, 2008. ^ Saltzman, Marc (August 2, 2008). "Gaming merger leaves Ghostbusters in limbo". Toronto Star. Retrieved February 13, 2009. ^ Sinclair, Brendan. "Brutal Legend, Ghostbusters, more dropped by Activision". Archived from the original on April 7, 2009. ^ Noonan, Keith (April 20, 2018). "Activision Blizzard Aims to Breathe New Life Into This Classic Franchise". The Motley Fool. Retrieved March 2, 2019. ^ "Activision Blizzard Inc details". businessweek.com. p. 2. Retrieved August 27, 2009. ^ Klepek, Patrick (April 29, 2010). "Industry Shocker: Developer Bungie Signs Deal With Activision". G4tv.com. Archived from the original on January 12, 2013. Retrieved April 30, 2010. ^ Kohler, Chris (April 29, 2010). "Bungie, Activision Sign 10-Year Publishing Deal". Wired. Archived from the original on May 2, 2010. Retrieved April 30, 2010. ^ Palmer, Maija; Bradshaw, Tim (June 30, 2010). "Computer games industry hits at tax rethink". Financial Times. Archived from the original on July 3, 2010. Retrieved June 30, 2010. ^ Crecente, Brian (November 11, 2011). "Call of Duty: Modern Warfare 3 Shatters All Sales Records". Kotaku. Archived from the original on November 13, 2011. Retrieved November 11, 2011. ^ a b c Ewalt, David (July 29, 2011). "Bobby Kotick On Hatching Skylanders: Spyro's Adventure". Forbes. Archived from the original on May 27, 2015. Retrieved August 29, 2015. ^ "Skylanders story". polygon.com. April 16, 2014. Archived from the original on September 1, 2015. Retrieved August 29, 2015. ^ Takahashi, Dean (June 5, 2012). "With Skylanders Giants, Activision could dominate toys and video games (video and gallery)". VentureBeat. Archived from the original on January 22, 2016. Retrieved August 29, 2015. ^ Appell, Adrienne. "Toy Industry Unveils Nominees for 2012 Toy of the Year (TOTY) Awards; Announces Inductees into Toy Industry Hall of Fame". Toy Industry Association. Archived from the original on June 7, 2012. ^ a b "Activision Blizzard Announces Transformative Purchase of Shares from Vivendi and New Capital Structure". Archived from the original on July 28, 2013. Retrieved July 25, 2013. ^ Seppala, Timothy (October 13, 2013). "Activision Blizzard completes buyback from Vivendi Universal in multi-billion dollar deal". Engadget. Archived from the original on January 3, 2016. Retrieved August 29, 2015. ^ Makuch, Eddie (October 12, 2013). "Activision Blizzard completes buyback from Vivendi". GameSpot. Archived from the original on October 15, 2013. Retrieved October 15, 2013. ^ "Vivendi to sell 41.5 million Activision Blizzard shares". Archived from the original on July 14, 2014. Retrieved July 6, 2014. ^ Hussain, Tamoor (January 15, 2016). "Vivendi Sells Remaining Activision Blizzard Stake to Unknown Buyer". Retrieved January 23, 2018. ^ a b Kain, Erik (September 10, 2014). "'Destiny' Crosses $500 Million On Day One, Biggest New Video Game Launch Ever". Forbes. Archived from the original on September 10, 2014. Retrieved August 29, 2015. ^ Chmielewski, Dawn (December 10, 2013). "Challenge for Activision CEO: capitalizing on next-gen game consoles". Los Angeles Times. Archived from the original on October 24, 2015. Retrieved August 29, 2015. ^ "The Top 25 Public Companies Generated $54.1Bn Game Revenues in 2014, Up 10.4% Year-on-Year". NewZoo. April 20, 2015. Archived from the original on May 22, 2015. Retrieved May 22, 2015. ^ "Activision Blizzard - Annual Report 2013" (PDF). Archived (PDF) from the original on July 14, 2014. ^ Yin-Poole, Wesley (June 3, 2015). "Skylanders SuperChargers adds vehicles to the list". Eurogamer. Archived from the original on July 6, 2015. Retrieved June 3, 2015. ^ Parfitt, Ben (September 18, 2015). "Destiny: The Taken King claims PSN's records". MCV - UK. Archived from the original on October 22, 2015. Retrieved October 23, 2015. ^ Vincent, James (2016-01-13). "Activision Blizzard recruits ex-Tarantino producer to turn its video games into films". The Verge. Retrieved 2018-12-19. ^ Jackson, Jasper (2017-04-05). "Could the Call of Duty franchise be the next Marvel?". The Guardian. ISSN 0261-3077. Retrieved 2018-12-19. ^ "Activision Blizzard Aims for the Big Leagues". Retrieved January 23, 2018. ^ a b Axon, Samuel (February 12, 2019). "Activision-Blizzard lays off 775 people after "record results in 2018"". Ars Technica. Retrieved February 12, 2019. ^ Bailey, Dustin (March 1, 2019). "Activision reports $164 million in revenue from handing Destiny back to Bungie". PCGamesN. Retrieved March 2, 2019. ^ "2017 Annual Report". activision.com. ^ a b c d e "Report: Major League Gaming shuttered after $46 million Activision buyout". Ars Technica. Archived from the original on January 4, 2016. Retrieved January 4, 2016. ^ a b "Activision Buys Major League Gaming to Broaden Role in E-Sports". The New York Times. Archived from the original on January 14, 2016. Retrieved January 5, 2016. ^ "Blizzard to launch pro sports league for 'Overwatch'". USA TODAY. Retrieved 2018-12-21. ^ "Blizzard to launch pro sports league for 'Overwatch'". USA TODAY. Retrieved 2019-01-06. ^ Song, Kelly (2017-07-16). "Activision Blizzard is building a professional esports league". www.cnbc.com. Retrieved 2019-01-06. ^ Makuch, Eddie (2018-08-08). "Overwatch League Grand Finals Reached Nearly 11 Million Viewers". GameSpot. Retrieved 2019-01-06. ^ "Overwatch League aims to get teams to their home cities by 2020, sources said". ESPN.com. 2018-06-06. Retrieved 2019-01-06. ^ Seitz, Patrick (11 July 2018). "Activision Signs Esports Broadcast Deal With Disney For Overwatch League". Investor's Business Daily. Retrieved 6 January 2019. ^ Jr, Carlos M. Gutierrez (2017-03-27). "Activision Blizzard CEO Bobby Kotick on Inspiring Play, Competition, and Community". Huffington Post. Retrieved 2019-01-06. ^ Fogel, Stefanie; Fogel, Stefanie (2018-10-15). "Call of Duty Endowment Finds Jobs For 50,000 Veterans". Variety. Retrieved 2019-04-10. ^ Gutierrez, Jr., Carlos M. (27 March 2017). "Activision Blizzard CEO Bobby Kotick on Inspiring Play, Competition, and Communit". Huffington Post. Retrieved 20 January 2019. ^ Fogel, Stefanie (15 October 2018). "Call of Duty Endowment Finds Jobs For 50,000 Veterans". Variety.com. Retrieved 20 January 2019. ^ a b Work, Great Place to. "Activision Blizzard". Great Place To Work United States. Retrieved 2019-01-29. ^ "Fortune 100 Best Companies to Work ForÂ® 2018". Great Place To Work United States. Retrieved 2019-01-29. ^ "Best Workplaces in Southern California". Great Place To Work United States. Retrieved 2019-01-29. ^ "People's 2018 Companies that Care list". Great Place To Work United States. Retrieved 2019-01-29. ^ "PEOPLE's 2017 Companies that Care list". Great Place To Work United States. Retrieved 2019-01-29. ^ Krangel, Eric (March 11, 2009). "Worlds.com CEO: We're 'Absolutely' Going To Sue Second Life And World Of Warcraft". Business Insider. Archived from the original on April 4, 2016. Retrieved March 29, 2016. ^ Bayer, Rudi (April 27, 2010). "Worlds.com vs. NCsoft lawsuit settled". Joystiq. Archived from the original on February 10, 2015. Retrieved February 18, 2019. ^ "Activision Blizzard sued for patent infringement of virtual worlds usage". GamesIndustry.biz. ^ a b "Activision Publishing Files Patent Infringement Lawsuit against Worlds Inc. and Worlds Online Inc". Activision Blizzard press release. October 4, 2013. Archived from the original on April 16, 2016. Retrieved March 29, 2016. ^ Suszek, Mike (October 7, 2013). "Activision files virtual worlds patent countersuit against Worlds Inc". Engadget. Archived from the original on April 26, 2016. Retrieved March 29, 2016. ^ Corriea, Alexa Ray (October 7, 2013). "Activision files software patent infringement suit against Worlds Inc". Polygon. ^ "Activision Publishing Lawsuit Against Worlds Inc., Worlds Online Dismissed With Prejudice". finance.yahoo.com. ^ Harper, Elizaabeth (March 19, 2014). "Blizzard scores a victory against patent troll Worlds, Inc". Engadget. Archived from the original on April 26, 2016. Retrieved March 29, 2016. ^ Roberts, Jeff (March 14, 2014). "World of Warcraft beats trolls in fight over 1996 "virtual worlds" patent". Gigaom. Archived from the original on April 5, 2016. Retrieved March 29, 2016. ^ "Worlds Inc. v. Bungie, Inc. – Patent Arcade". patentarcade.com. ^ Inc, Worlds (December 1, 2016). "USPTO Review Validates 6 Worlds Inc. Patent Claims for Multi-Player Online Gaming Technology". GlobeNewswire News Room. ^ Kollar, Phil (March 1, 2010). "UPDATE: Infinity Ward Vs. Activision". GameInformer. Retrieved May 21, 2010. ^ Walker, Richard (March 4, 2010). "Future Modern Warfare Releases Could Be Vetoed By West and Zampella". Xbox360Achievements. Retrieved May 21, 2010. ^ Reilly, Jim (April 9, 2010). "Activision Countersues Former Infinity Ward Execs". IGN. Retrieved May 21, 2010. ^ Ryckert, Dan (April 27, 2010). "Activision Sued By New "Infinity Ward Employee Group"". GameInformer. Retrieved May 21, 2010. ^ McWhertor, Michael (May 31, 2012). "Settlement reached in Call of Duty's billion dollar West v. Activision lawsuit". Polygon. Retrieved February 19, 2019. Wikimedia Commons has media related to Activision Blizzard.